A thank you to our Volunteers – it couldn’t be done without you! October 2017 marked the one year anniversary of the Red Squirrels United (RSU) project that Red Squirrels Trust Wales are managing in North Wales (Gwynedd/Anglesey and Clocaenog Forest). At the same time it was 6 months before the end of the British Association for Shooting and Conservation (BASC) ‘Green Shoots’ project. Volunteers on the Green Shoots project have carried out grey squirrel control so RSTW have worked with BASC to share resources, ideas and to ensure best coverage of the areas that both projects work in. What better way to celebrate and to say thank you to all the volunteers than to invite them to a joint Volunteer Thank You Day. Natural Resources Wales (NRW) manage Clocaenog Forest so Iolo Lloyd and Liz Halliwell also joined us and helped with the smooth running of the day. The Centre, Ruthin, were our hosts and ample tea and coffee was supplied throughout the day. 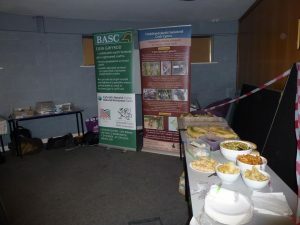 BASC kindly provided funds for the hire of the venue and for lunch. Volunteers from across both projects enjoyed an initial presentation from Becky Clews-Roberts and Holly Peek, Red Squirrel Rangers who gave highlights of the RSU project to date. 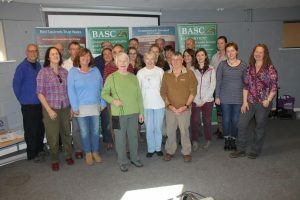 Newly in post with BASC, Sarah Pinnell, Green Shoots Wales Officer, gave feedback on the Green Shoots project and Ian Danby, Head of Biodiversity Projects, shared his aspirations for the future. The BASC presentation has been summarised below. Clocaenog Forest volunteer Mal Ingham gave an entertaining talk on what volunteering for the RSU project entails and he was followed by Dr. Liz Halliwell, Mammal Ecologist NRW who spoke about Clocaenog’s red squirrels and the work that has taken place to safeguard them. Becky Hulme, Red Squirrel Project Officer for South and West Wales Wildlife Trust joined us for the day and she led a breakout session. 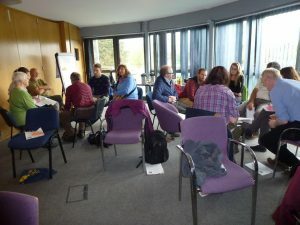 Volunteers split into groups to discuss how to progress with the formation of a ‘friends of red squirrels’ group, akin to those that already exist across the border. The information gained was very useful and has given Holly and Becky plenty to consider. Holly supplied a magnificent buffet lunch with the biggest baguettes we’d ever seen! 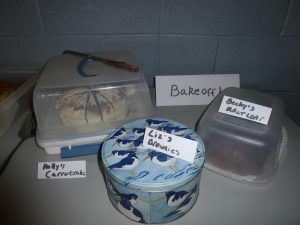 Followed by a ‘bake-off’ competition of cakes made by Becky, Holly and Liz! NRW’s Senior Conservation and Heritage Manager Iolo Lloyd talked enthusiastically about the role NRW play in biodiversity management when planning forestry works. 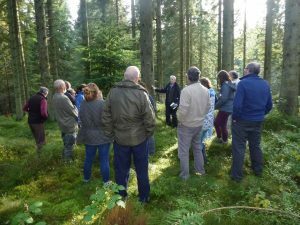 He also led on the finale – a guided walk around the Bod Petryal section of Clocaenog Forest. What Iolo doesn’t know about the forest isn’t worth knowing and he ably answered all the questions that volunteers asked of him. We even caught a rare sight of Iolo hugging a tree! We are now well into the second year of the project with lots of ideas on how we can ensure the future of reds in north Wales and look forward very much to working alongside such a dedicated team of volunteers. If you would like to volunteer with RSTW please don’t hesitate to contact us – see Home page for contacts. BASC’s Green Shoots Project aim is to recognise, build upon and co-ordinate the shooting community’s considerable contribution to wildlife and biodiversity conservation. The project has formed strong partnerships with the public, private and voluntary sectors, to manage non-native invasive species in the target areas. 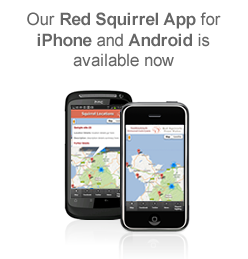 There are six mink and three grey squirrel control network areas working with RSU, NRW and other partners. Twenty-eight traps are in 4 of the Cynwyd woodlands and also on Rhug main estate, with trail cams in the Cynwyd woods. A total of 32 volunteers have been trained in Bangor, Clocaenog and Cynwyd areas, with further training ongoing and new trappers taking part. In Mid Wales 54 volunteers have been trained to date and provide grey squirrel control information and support Mid Wales Red Squirrel Project buffer zone. 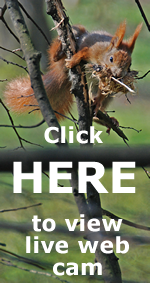 Last year, 503 squirrels were culled in the main areas. Going forward, the current Green Shoots project is funded until March. BASC and RSU will continue to support volunteers in collecting data, assisting with kit or any other issues. A huge thanks to all those volunteers and coordinators in the trapping areas who support RSU and BASC giving their time and expertise to create a most efficient, cohesive network of control.